Anatech Electronics Band stop filters expertise is derived from the many years of design experience, knowledge, and emphasis on customer requirements. A derivative of Band stop filters are the Notch filters which also are a type of band stop, but are used in many case to reject just a single frequency, or has a narrow notch band. The band stop filter requires more Q factor in order to have a equivalent sharpness as oppose to band pass filters. Since most filters are derived from the basic low pass filters, and then converted thru matematical process to a band stop filter, that type of filter requires more sections in order to have an equivalent pass band to reject band transition. That said the band stop filters are more complex to design, and requires carefull adjustment, and attention to the exactness of the element values in order to give the result it was intended to give. 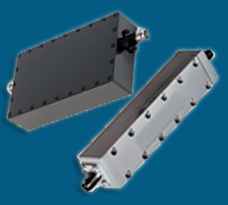 Anatech Electronics, standard band stop and notch filters are a collection listed in our library of standard product. Each band stop filter was previously built and proven to work. Please look up the band stop or notch filter from our library, and chances are that you will find a product that will match, or close to it. In many cases we can modify the original product to better match your requirements. If all fails and you cannot that specific band stop or notch filter, complete the custom band stop form, and we will help you get the band stop filter that matched your requirement. We can find the Bandstop/Notch Filter for you!